The freedom to paint every day — that’s what Harold Garde found in Belfast. 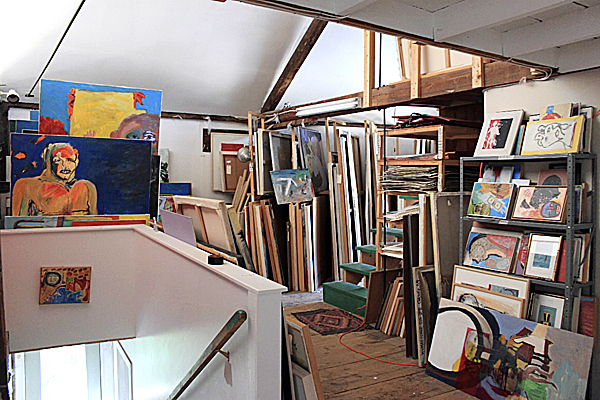 His two-story studio, home to thousands of acrylic paintings and strappo prints, is a sensory overload of color, texture, composition and emotion. A broad label for his artwork is “expressionism,” which describes any art that presents the world from a subjective perspective, re-creating the artist’s emotional and ideological reality rather than a shared physical reality. Garde was born in New York City in 1923. “When you grew up in that time in New York, there was such hope for the achieving of art in the community,” Garde said, remembering an active theater and sharing Billie Holiday V-Discs. During WWII, Garde served in the Army Air Force for three years. While stationed in the Philippines, he met actors and musicians who came to entertain the troops and fellow soldiers who had an interest in the arts. What he learned about humanity during his travels bleeds into his work. After the war, the GI Bill of Rights enabled Garde to continue his education. He didn’t want to go back to the sciences, which he already had studied for three years. At the “other end” of the academic spectrum was art. “I thought it would be pretty easy to teach art, the fool that I was,” Garde said. He completed a master’s degree in fine arts education from Columbia University and supported a family of four children — Elissa, Tessa, Amy and Keith — by teaching art courses and working in architectural design in New York. Garde moved to Maine when he retired from teaching in the mid-1980s. 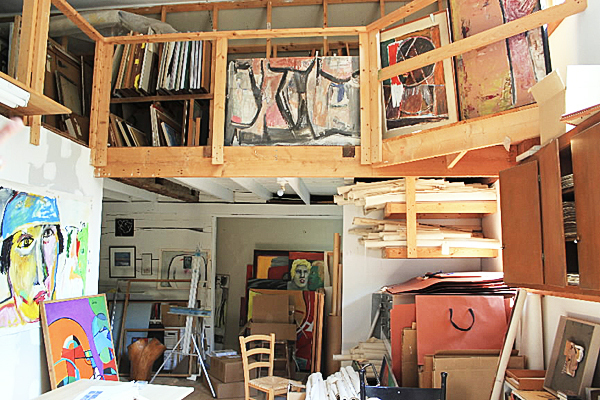 His second wife, Barbara Kramer, wanted to be near the water, and Garde wanted space for his own studio. Neither of them had been to Maine. When he arrived, more galleries were opening in Belfast. “And suddenly Belfast was the hot place in Maine for art, just like Rockland is now,” he said. Maine influences Garde’s paintings in ways that he can’t identify. There’s a consistent difference in color between artwork he created in New York and artwork he created in Maine. In Maine paintings, vibrant reds, oranges and purples replace the browns and grays prevalent in his city paintings. While building his first Maine studio on the waterfront in Belfast, the carpenters started putting in windows. Garde told them to stop — he wouldn’t get his work done if he had windows. He would go out onto his porch if he wanted to see the ocean. He starts a painting by covering the canvas with areas of color, trying to use his ingrained sense of design. He paints mostly with acrylics on canvases of all sizes, but he also works with ceramic, clay and prints. Some themes reoccur. For example, he has a series of paintings, strappos and sculptures in which the subject is a kimono, a chair or a human head. Garde developed and named strappo printmaking — a combination of painting and printmaking — which he teaches in workshops throughout Maine and Florida. He completes about 30 paintings and 200 strappos each year. In some paintings, he uses letters and numbers as a focal point, but he often doesn’t have a definite reason for the word or number sequence. Although he doesn’t paint for galleries, he can’t count the number of shows he has displayed in since his first exhibit in 1970. On Aug. 27, Garde attended the opening of his exhibit at the Courthouse Gallery in Ellsworth. He shares the exhibit “Abstract Expressionism” with two artists — Stephen Pace and George Wardlaw. Two films have been made about Garde’s life and art: a 30-minute film as part of “Maine Masters,” a nine-film series by the Union of Maine Visual Arts; and a one-hour film, “Harold Garde, Working Artist” by Dale Schierholt.